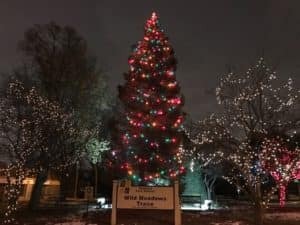 The first tree-lighting ceremony of the holiday season takes place in Elmhurst on Saturday evening, Nov. 18. The Elmhurst Holiday Tree Lighting Ceremony promises to be fun and memorable for everyone, especially families with young children. Beginning at 6 p.m., students from Edison and Jefferson schools will provide festive musical entertainment. Stay warm in the chill evening air with some hot chocolate and cookies. Around 6:30 p.m., Santa Claus will arrive in style on a fire engine before the big moment when the holiday tree is lit. All of us at Elmhurst Toyota look forward to this evening filled with fun and holiday spirit. If you’ve ever wondered about the origins of the beautiful trees we love to look at every winter, we have the answers. Christmas trees are a tradition that can be traced back hundreds of years. The evergreen trees typically displayed during the modern holiday season may have originated in Renaissance-era Germany. Countries around the world have their own unique traditions of decorating trees in the wintertime, which immigrants brought with them to the United States. According to the National Christmas Tree Association, about 25 to 30 million live trees are sold throughout the country each holiday season. Most come from Christmas tree farms, where farmers are currently growing approximately 350 million evergreen trees. The Holiday Tree Lighting Ceremony is sponsored by the Spring Road Business Association. The association was started in 1950 by a group of Elmhurst business owners. The organization sponsors events and activities throughout the year to foster a sense of community in Elmhurst and aid local businesses. This Elmhurst Holiday Tree Lighting Ceremony is always a lot of fun, so bring the family. We hope to see you there! Saturday, Nov. 18, 2017, 6-7 p.m.